According to Wikipedia (so, it must be true), the ‘Pizza’ was invented in 1889 when Neopolitan pizza maker Raffaele Esposito was commissioned by the Royal Palace of Capodimonte to create a pizza in honour of Queen Margherita. The tomato, mozzarella cheese and basil creation – as legend would have it – matched the colours of the Italian Flag – and so, the humble Margherita was born. Pizza is incredibly simple to make. Pizza is cheap to make. Pizza is really quick to make. Before hitting the speed-dial for your favourite home delivery service, ask your self this question: “Can I make something from scratch which is tastier, cheaper, and a whole lot healthier than if I order in?” You can have something unique and delicious in around 40 minutes from scratch. The basic ingredients to make the base are strong white flour, fast acting yeast, water, olive oil. Add passata (sieved tomatoes) and mozzarella cheese, and you are there. The rest comes down to what you have at hand, imagination, and the desire to try new things. Be experimental. Have fun. Forget the humdrum formulaic offerings out there which have dominated our high streets for many years – try and invent something you have never had before (within reason, obviously!). I was doing a quick stock-check of what I had loitering around in the freezer and cupboards, and had: frozen smoked salmon (it takes minutes to defrost), artichoke hearts in a jar, and mozzarella cheese (which was rapidly approaching its use by date). 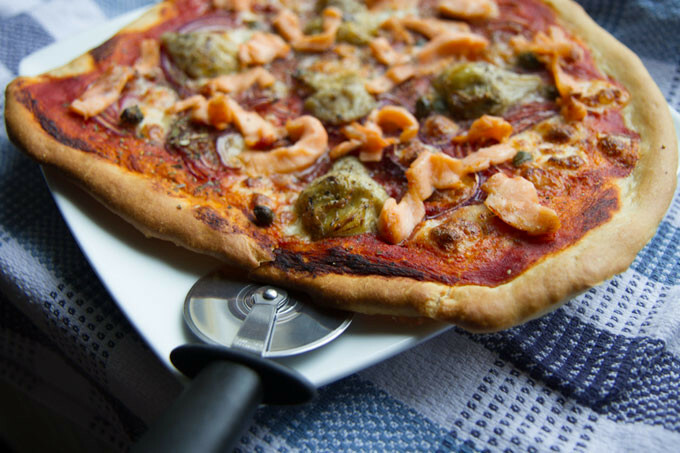 I could think of one thing, and one thing only to rustle up: A smoked salmon, artichoke, and red onion pizza with a few capers to boot. Had I made it before? No. Had I seen it on a menu before? No. Would I make again? For sure. Is a home made pizza going to produce exactly the same results as your favourite artisan pizzeria baked in a specialist oven? No, but it will be damn good. To make life a little easier, and to produce a crispier base, I strongly advocate investing in a non-stick aerated pizza crisper. It may not be essential, but so worth the £7 or so purchase price. You may want to look at pizza stones and other similar solutions. Place the flour, salt, and yeast into a large mixing bowl and create a well in the centre. Pour the warm water and olive oil into the centre, and fold in the ingredients until you form a dough. Do not be worried if it is quite sticky to begin with. Flour your hands and a work surface, and start to knead into a dough. It is perfectly normal for the dough to stick to your fingers. Have flour to hand (a flour shaker is ideal) and add a very small quantity until the dough starts to firm up in texture. When the dough starts to come away from your fingers, knead for about 5 mins and mould into a firm and elastic dough ball. Wipe down the mixing bowl (this saves washing up) and spray a little olive oil so that the base and sides has a slightly oily film. Personally, I use an oil spray bottle. Brush a little oil on top of the dough, and cover the mixing bowl with cling film. Allow to prove at room temperature for 20 mins, or until double in size. 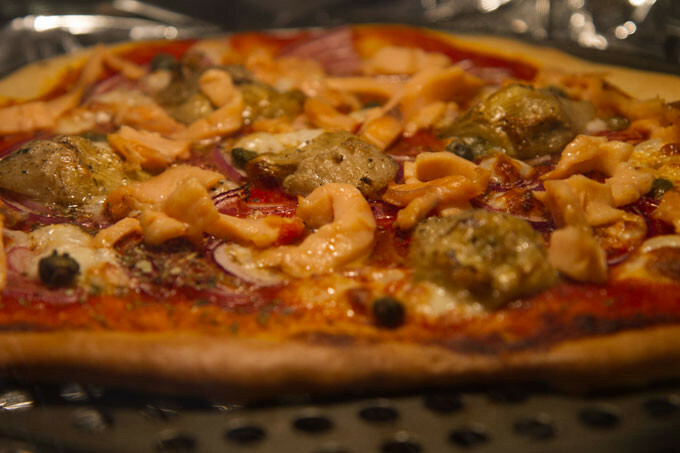 Whilst the dough is proving, slice the onion and smoked salmon, drain and dry using kitchen paper the artichoke heart and capers, then half way through turn on the oven to 200C. Once the dough has doubled in size, place on a well-floured surface or a silicone rolling mat, and, using the base of the palm of your hand, gently stretch out the dough from the centre. If you can made it perfectly round, then great. If edges are uneven, I think better still. This is your individual creation, and not machine made. Relish in the fact! Carefully place the pizza base on a well-oiled tray, or aerated pizza tray. Then, spoon and spread the passata from the centre using the back of a spoon or spatula. Next, sprinkle with the mozzarella pieces and oregano. Distribute the red onion slices on the base, sprinkle the capers and evenly place the chunks of artichoke heart. Cook in the oven for 10 minutes at 200C, then remove, add the smoked salmon, and return to the oven for 5-6 minutes. Remove from oven, turn onto a warm plate, season with black pepper and (optionally) a few drops of freshly squeezed lemon juice, and enjoy. Previous Post: « Sun-dried tomato bread with oregano and sea salt crust.